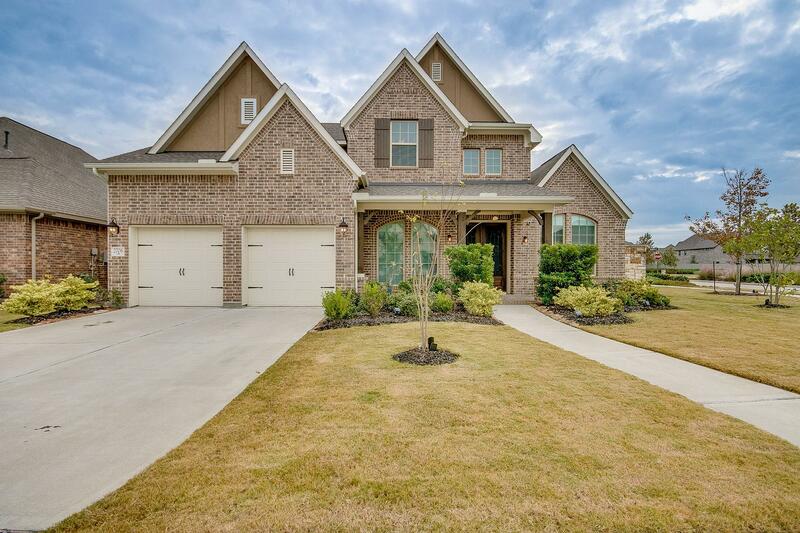 The gorgeous home is FULL of Upgrades and already has a POOL just waiting for you! Incredible floor plan is unique to the Pomona community & offers both formals, family room with wall of windows overlooking your backyard & covered patio, amazing island kitchen with high-end granite, gorgeous custom cabinetry and stylish top of line ($20k upgrade) Ferguson appliances including 2 separate ovens, convection microwave & 6 burner gas range. The master suite is a relaxing oasis with sitting area & luxury bath. Two bedrooms down and each bedroom has it’s own bath. Much more too with incredible storage space, whole house reverse osmosis water system. Amazing corner lot location with no back neighbors, close distance to elementary school, shopping & restaurants, great commute. Pomona amenities include miles of hike and bike trials, a resort-style pool, fish camp and acres of natural areas located along Mustang Bayou. This description does not do this home justice and you ARE going to want to see this one for yourself so call today to schedule your private tour!